16th April 2018. Monday. 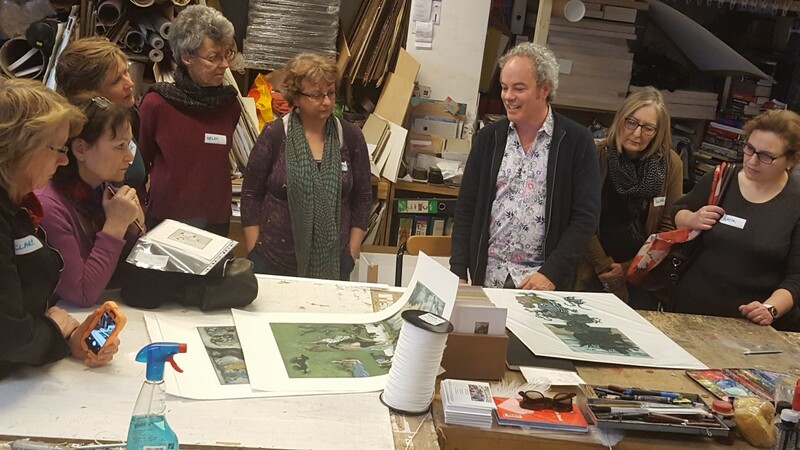 A chilly but sunshiny day as members of the Printmaker’s Council, a score in all, arriving from various boroughs of London and the shires, congregated at Blue Anchor Lane in Bermondsey to meet the painter and printmaker Mychael Barratt in his workshop. 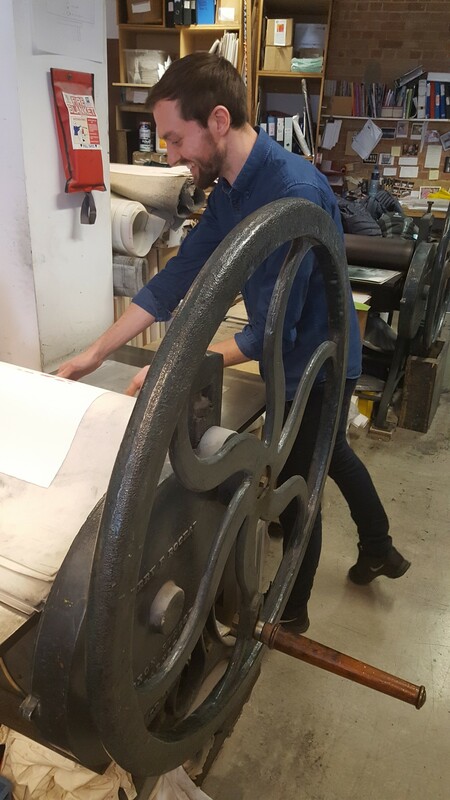 Mychael greeted us, fresh and dapper in a bright, floral shirt and wearing an even brighter smile, introduced us to his tall and friendly assistant, Peter, assiduously busy in the background, inking-up, wiping and running a three-colour etching of a dog through the press. Mychael followed his introduction with a convivial tour of the premises which includes a courtyard that extends into the brick arches of the overhead railway-line and where, behind some council bins (!) he keeps his aquatint box. 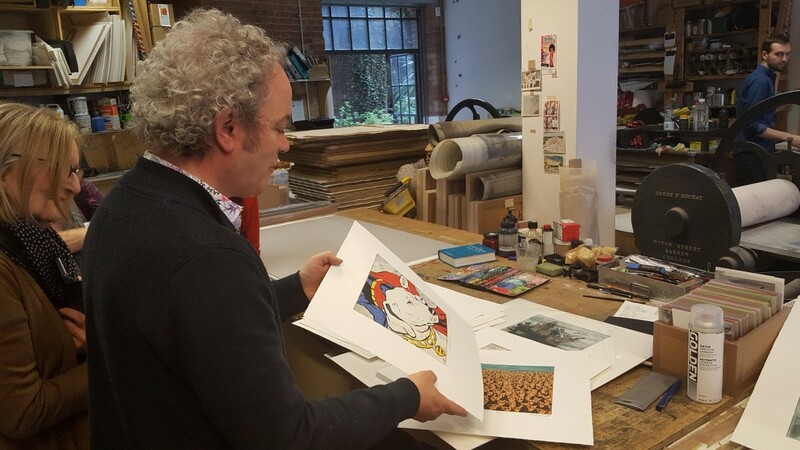 Back inside he talked us through a series of etchings he was working on which included Artists’ Cats and Dogs where he imagines the pets of well-known artists (Hockney’s poolside sausage-dogs got a good chuckle from everyone, but my favourites were the Gormley and Weiwei) and various pictorial map projects, such as the ‘New York Map of Days’ and closer to home, ‘Notes from the Underground’. 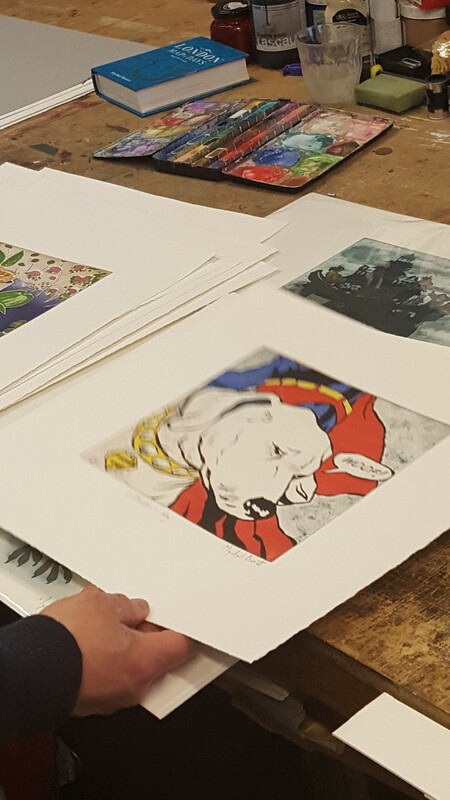 These etchings were visually arresting and impressively large-scaled – and who knew that the last Beatles concert on 30 January 1969 happened on the same day in London as the public execution of Charles I in 1649? 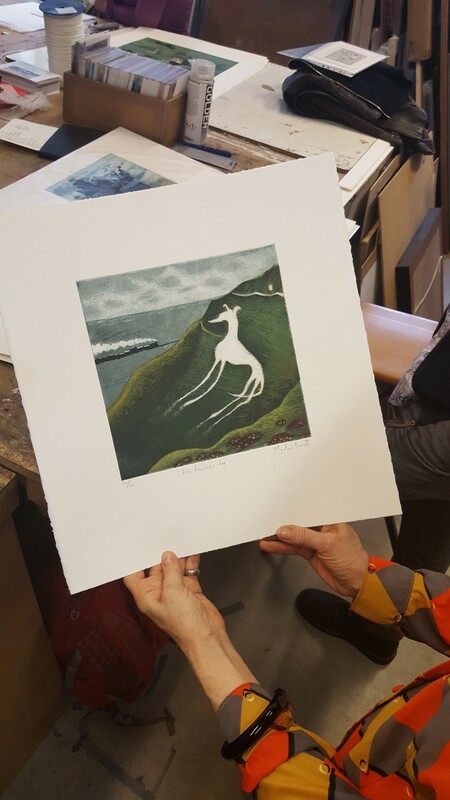 The group enthused, bombarded him with questions – technical things about material and process, the use of watercolour to hand-tint etchings, his division of labour, (he travels to Whitstable to screen print) his inspirations – which he fielded with generousness and adroit clarity. Certainly I left the studio, belly filled with tea and cake, itching to draw and print.